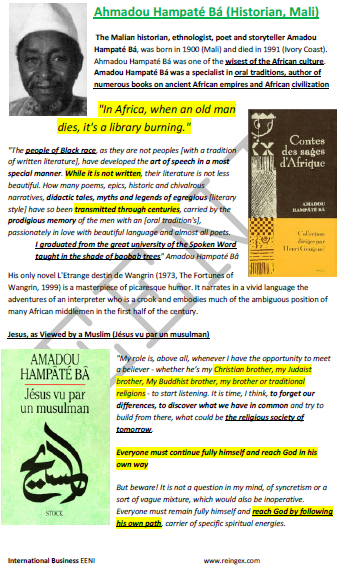 Syllabus of the Online Course (Subject): Amadou Hampaté Bá (Ethnologist, Mali). The Malian Historian, ethnologist, poet and storyteller Amadou Hampaté Bá, was born in 1900 in Mali; he died in 1991 in Ivory Coast. Amadou Hampaté Bá was one of the great scholars of African culture. Amadou Hampaté Bá was a specialist in the oral traditions, author of numerous books on ancient African Empires and Civilisation. “My role is, above all, whenever I have the opportunity to meet a believer - whether he is my Christian brother, my Judaist brother, My Buddhist brother, my brother of traditional religions - to start listening. It is time, I think, to forget our differences, to discover what we have in common and try to build from there, what could be the religious society of tomorrow. 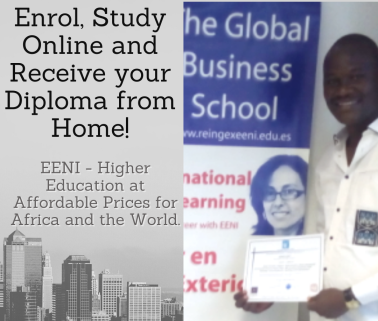 More information about Mali (African Portal - EENI Business School & HA University). Amadou Hampaté Bá was an African Historian of West African Economic Area (African Civilisation).